However, big-money, multi-year Major League contracts have a way of….well, not working out so great. There’s Albert Pujols in Anaheim (and Josh Hamilton, too). There’s Miguel Cabrera in Detroit, Max’s former home. There’s Vernon Wells. Pablo Sandoval and Hanley Ramirez in Boston. Melvin Upton, Jr. Barry Zito. The list is … long. 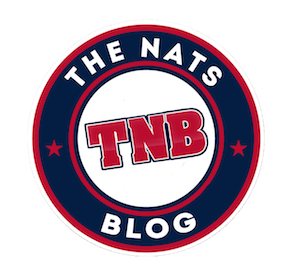 Some would say, “Don’t forget about Jayson Werth!” but NO, wearenotgoingtherethankyouverymuch. A reason for this? MLB players don’t get a shot at their big free agent payday until they’re about to start their decline phase, or until they’re already in it. Max was 30 when he signed his deal, generally considered to be the age when players – especially pitchers – begin to see their skills decline. But Max has been a wonderful, glorious, pump-you-up exception to the rule. I’m not going to do a deep dive into Max’s numbers here because you know they’re absolutely jaw-dropping since he came to the Nats, especially this year. Just head over to Baseball-Reference or FanGraphs and bask in their glory. He’s running a K/9 rate that RELIEVERS would kill for right now. There is nothing that a pitcher needs to do well that he does not do extraordinarily well. I would be surprised if he doesn’t win a third straight Cy Young. His ticket to Cooperstown is probably booked already. Let’s talk more about the way Max goes about being the best pitcher in baseball while playing for our favorite baseball team. There’s the no-hitters (one of which I was fortunate to attend), the almost no-hitters, the 20-K game, the array of pitches that leave bats swinging through air or knees buckling. There’s the snarling, evil, rip-the-soul-from-hitter’s-bodies attitude that he brings to the mound, especially in pressure situations or when he’s “emptying the tank,” as F.P. Santangelo likes to say. 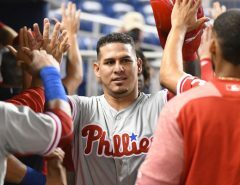 There’s the unbridled enthusiasm that he displays for hitting, a characteristic that led to an unforgettable moment on June 2 against the Braves, when Max pinch hit in the 14th inning, got a base hit, then proceeded to round the bases like a wild man on Wilmer Difo’s triple to give the Nats the winning run. He then still had enough energy to whoop and holler through the dugout like he had just scored a goal in overtime of the Stanley Cup Playoffs. 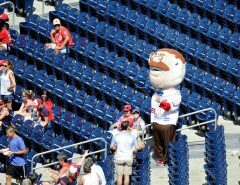 Oh, and speaking of the Stanley Cup Playoffs – Max, along with Ryan Zimmerman, led the “Let’s Go Caps!” chant before Game 4 of the Stanley Cup Final at Capital One Arena. Donning a helmet, a uniform, and a stick, Max looked like a little kid living a dream. 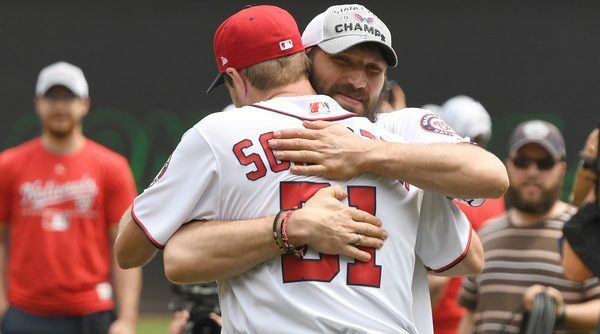 His eagerness to root on the Caps, which he does even WHILE HE’S PITCHING, endears him to the District faithful even more. If you’re a DC sports fan, you can’t read that quote often enough. Not only does Scherzer deliver must-see performances every fifth day, he also … gets it. He understands his position as a marquee athlete in the nation’s capital and savors every aspect of it. 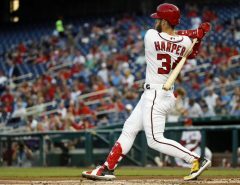 On a roster filled with homegrown stars like Harper and Stephen Strasburg, it’s the free-agent pick-up who had the weight of the world put on his shoulders after signing a massive contract that has emerged as the true face of the franchise. What’s left for Max to do? Well, that’s obvious. His two trips to the postseason in a Nats uniform have been a mixed bag, with not a single appearance leading to a Curly W. The details behind that are complicated, from shaky outings to a lack of run support to a poorly-timed injury to an inning that we all know Max does not want to be his final playoff performance. But before we think ahead to October, revel in this incredible tear that Max is on. Savor every high-90s fastball swung through, every hard-breaking slider, every march around the mound, every teeth-gnashing, multi-colored eye-popping stare into the batter’s box with runners on second and third and Max at 105 pitches, guarding a one-run lead. Because it’s not often your team features the game’s best arm, an all-time great whose legacy will never be forgotten by DC baseball fans, whether the team hoists a World Series trophy during his tenure or not.